GREAT NEWS! Special guest from Chinese Man records: TOMAPAM will make an outstanding warm up before Deluxe concert! Founded in 2007, Deluxe is a band that mixes jazz, funk, hip-hop, dubstep and electro to create its own unique musical recipe in which one thing remains constant: the groove! Unlike many other bands classified as "Electro Music" that mainly only use machines to perform their music, Deluxe chooses the opposite approach by positioning itself as a true band of musicians that enhances their tunes with loops or samples. Deluxe has toured in countless cities and countries, rapidly gaining popularity and success around the world. This year, they are bringing their unique flavour and energy to Hong Kong. Are you ready to feel the Groove? Deluxe’s performance offers an explosive and contagious energy that exhilarates both the body and mind! 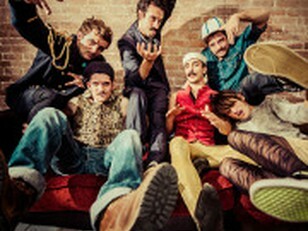 Deluxe primarily consisting of five friends who improvised as an urban quintet that attracted attention by performing on the streets in Aix-en-Provence in the South of France. These five passionate musicians are accompanied by Liliboy - the singer with a sweet but explosive voice. It is through street performance that Deluxe has acquired the spontaneity and excitement they now express on stage while performing. Their success, talent and positive energy are the reasons why Chinese Man Records decided to send them on the road to keep on spreading their groove and zen spirit to a bigger international crowd. After 2 remarkable EP, their first album released in September 2013, The Deluxe Family show, reflects the maturity acquired by the band during the years, full of tracks as diverse & breathtaking as the fellows moustaches. "IF YOU LIKED IT, COME BACK WITH A MOUSTACHE!"